Customers have the freedom to pay using Visa and MasterCard credit and debit cards, with receipts sent via email or text. Accessible on mobile or tablet with a small-size terminal allowing you to connect and carry to your business everywhere you go. All you need is an Android Smartphone and start running transactions just 24 hours after you sign up. Easy sign up process with one-off device cost, simple transaction fee and no annual maintenance fees. Place your order here and pay for the Sabi card charging terminal. Register a business account, sign a merchant contract and add bank account. Set up your branches and cashiers to enable you to track and record all your Sabi transactions. 4. Download app & Start! 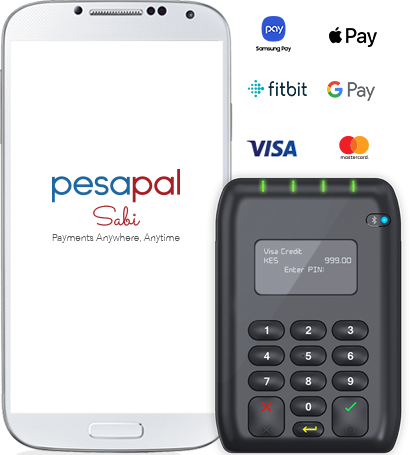 Download Pesapal Sabi from the Android Google PlayStore and start accepting card payments. You can run both Local currency (KES,TZS,UGX) and USD transactions. Send your clients a digital receipt through SMS or email at the point of sale. Supports cards which require customer to sign, providing on-screen signing. Track all payments in real-time with report showing status per transaction. When fully charged, lasts over 24hrs, with ability to charge 200+ transactions. Offers bank-level security with PCI PIN and PCI DSS service level 1 compliance. Fill in a request from here. Please note that delivery of your terminal can take up to 7 business days depending on your location. Create a Pesapal Business Account here. Please note that you will be required to sign a merchant contract and provide legal document before you start transacting. Find out more about that here. Once you set up your, business account, you need to create branches and cashiers to help you track your transactions. Find out how to set them up here. To download your Pesapal Sabi mPOS app, you will need an Android smartphone or tablet. Install and Log in with the cashier Phone Number and PIN received while setting up on your Pesapal Business Account. Don't have a Pesapal Business Account? Please create one here. Alternatively, you can download the app here. Creation of Branches and Cashiers allows you to track where your Sabi mPOS terminal was used and determine the source of the funds from the point of sale to your Pesapal Sabi account. To create a Branch and Cashiers for your Sabi mPOS account, you must log into your Business account on Pesapal. Navigate to the left hand side panel on your business account dashboard and click on POS. Click on the dropdown arrow and click on Branches. Create a branch by clicking on ‘Create a Branch’ and filling in the details in the fields provided. Once these details are saved, the branch will be available on the POS page under ‘Branches’. Cashiers can only be created within a Branch. To create a cashier, scroll to your preferred Branch and click on ‘Cashiers’. Click on ‘Create New Cashier’. Click on the green button and fill in the details in the provided fields. Once these details are saved, an email with an activation PIN will be sent to the cashier via the email address and texted to the number provided. The cashier will need this PIN as part of the registration/sign in process on their Pesapal Sabi mobile app. This PIN allows them to start transacting using the Sabi card reader. You can then select the cashier and make any edits. After a few minutes, your Sabi terminal pairing number will be visible under ‘Available Connections’. Please note that the Sabi terminal pairing number is the number at the back of the actual terminal. Both your phone and your card reader will ask for confirmation on the pairing. Press the green tick button on the Sabi terminal and OK on your Android device to complete the pairing process. Power up your Pesapal Sabi app to start transacting. Power up your Pesapal Sabi App and terminal. To power up your terminal, long press the small button on the left hand side. If your terminal was idle, long press the green tick button and it will come on. On the Pesapal Sabi phone app, enter the amount you wish to charge. Please note the position on the decimal point. Ask your client to confirm the amount and enter their PIN. Please give your client adequate privacy as they enter their PIN. Ask the client whether they would like an email receipt. If they do, enter their email address and one will be automatically sent to them. This transaction will automatically be updated under your 'View Activity' tab. On the transaction page, click on the green ‘Issue Refund’ button. A confirmation pop up will appear asking you to authorize the refund. Click yes. A notification will be sent to you once the refund is done. Once the account has been set up, navigate to the POS tab on the left hand side. You will then set up your branches and cashiers. Once the terminal is delivered, you can start transacting within 24 hours. You can also accept mVisa payments in Kenya. References on Sabi allow you to identify what exactly a client is paying for and keep accurate records of your transactions. This helps when you are working on financial reconciliations. References are added to a charge before inputting the amount. Click on icon on the top right hand corner of your app to add your reference. This could be a number, code or word used to identify exactly what the customer is paying for.